Everyone has anxiety as our lives now are getting more and more complicated than before. Relationships, career, family, financial problems, illness etc. It's natural and perfectly normal to worry, however, some of us worry so much up to an extent that it affect our daily routines, it's called anxiety disorder. People with anxiety disorder like me, tend to worry practically everything from little things such as a bug to upcoming big events, all the time, anywhere! When our worries become too overwhelming, we start to get panic, our palms will sweat excessively, our hearts beat faster and louder, our whole body feel uncomfortable, we feel nauseous and some of us eventually puke. That's how anxiety disorder feels like. I remember going for a job interview last year, on the way to the office, my worries started to amplified as we get closer to the destination. I had all the symptoms mentioned above, the next minute I knew, I was screaming and crying out loud like a newborn in the car. It felt like going to kindergarten on the first day all over again. I told mum I couldn't make it, it was too scary, I wouldn't be able to face the scary interviewer. Let's quickly make a U-turn and go home. Just like usual, mum would try to coax me, told me to calm down and everything was not as scary as I thought. In the end, after regaining my composure, I braved myself and walked into that office alone. Thank God that Running Man was on the tv while I was waiting for my turn at the lounge area, the laughter made me forgot about the anxiety for a while. Long story short, I got the job and the interviewer was not scary at all. However I found out that the job didn't suit me. In conclusion, all of these are just stories in my head. Thanks brain for the wild imagination. 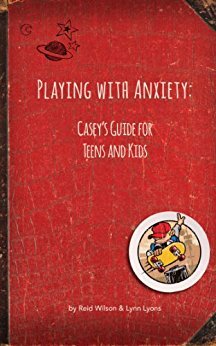 Here's a book I recently read about anxiety. It gave me a whole new insight about this condition I think all of you should read it too. It teaches us how to manage our anxiety when it strikes. It's available in Suria library, or you can go to this website and download its free ebook. Happy Reading and Happy Valentines Day!